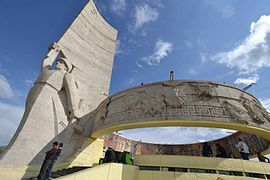 Ulaanbaatar, formerly anglicised as Ulan Bator /ˌuːlɑːn ˈbɑːtər/ (Mongolian: Улаанбаатар, [ʊɮɑːm.bɑːtʰɑ̆r], literally "Red Hero"), is the capital and largest city of Mongolia. 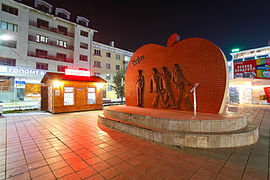 The city is not part of any aimag (province), and its population as of 2014 was over 1.3 million, almost half of the country's total population. 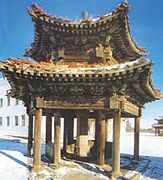 Located in north central Mongolia, the municipality lies at an elevation of about 1,300 meters (4,300 ft) in a valley on the Tuul River. 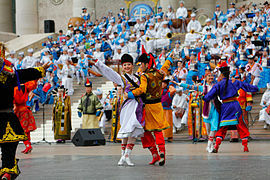 It is the country's cultural, industrial and financial heart, the centre of Mongolia's road network and connected by rail to both the Trans-Siberian Railway in Russia and the Chinese railway system. ^ Chisholm, Hugh, ed. (1911). "Urga" . Encyclopædia Britannica. 27 (11th ed.). Cambridge University Press. p. 795. 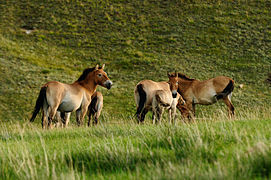 ^ a b Economic Development in Mongolia. The Asia Foundation. Available here; accessed 13 November 2016. 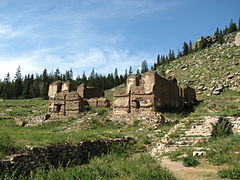 The 2009 Mongolian National Championship was the forty-second recorded edition of top flight football in Mongolia and the fourteenth season of the Mongolian Premier League, which took over as the highest level of competition in the country from the previous Mongolian National Championship. Ulaanbaatar DS were champions, their first title, Erchim were runners up, with Khasiin Khulguud in third place. Statistics of Niislel Lig in the 2011 season. The title was won by FC Ulaanbaatar which was their first ever title. 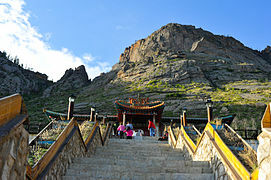 The 2013 Mongolian Premier League also known as Niislel Lig or Capital League is the 46th edition of the tournament. The number of teams reduce to seven due to the withdrawal of Ulaanbaataryn Mazaalaynuud in the 2012 season. It started on 1 May and ended on 31 August 2013. Erchim won the tournament for the eighth time by beating Khangarid 4–1 in penalties. Erchim will also advance to the 2014 AFC President's Cup representing Mongolia. The 2014 Mongolian Premier League also known as Niislel Lig or Capital League is the 47th edition of the tournament. Ulaanbaataryn Mazaalaynuud returned to the league after withdrawing from competition in the 2012 season, replacing Khasiin Khulguud to keep the number of teams at seven. The season started on 25 June and ended with the championship match on 30 August 2013. The top four teams in the standings advanced to the single elimination playoff stage. The 2015 Mongolian Premier League also known as the Khurkhree National Top League is the 47th edition of the tournament. Two new teams entered the competition, Deren and Soyombiin Barsuud to increase the number of teams to nine. The season started on 16 May 2015 and was ended on 26 September. The 2016 Mongolian Premier League (also known as the Khurkhree National Premier League) is the 48th edition of the tournament. Erchim came into the season as defending champions of the 2015 season. Ulaanbaatar City (formerly Khangarid City) and Bayngol entered as the two promoted teams from the 2015 Mongolian 1st League. Season started on May 7th and ended on October 9, 2016. The 2017 Mongolia Cup is the tenth edition of the Mongolia Cup, the knockout football tournament in Mongolia.It is sponsored by Arvain Undes. 30 teams were accepted into the tournament. It began with the 1st Round in 2017. Mongolian Premier League side Erchim are the defending champions. The 2017 Mongolian Premier League (also known as the Khurkhree National Premier League) is the 49th edition of the tournament. Erchim came into the season as defending champions of the 2016 season.Athletic 220 and Goyoo entered as the two promoted teams from the 1st League. The season started on April 29. The 2018 Mongolian Premier League (also known as the Khurkhree National Premier League) is the 50th edition of the top-tier football league in Mongolia. Erchim comes into the season as defending champions of the 2017 season.Arvis FC and Gepro FC entered as the two promoted teams from the Mongolian 1st League while Khoromkhon FC and Ulaanbaataryn Unaganuud FC were relegated.The season started on 28 April 2018. 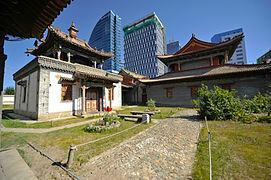 The country of Mongolia is divided into 21 provinces (Mongolian: аймаг, aimag) and the capital (нийслэл, niislel) Ulaanbaatar.Secondary subdivisions outside Ulaanbaatar are called "sum" (сум, often transcribed as soum). 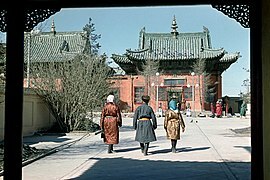 In 2006, Mongolia had 331 sums. Sums are further subdivided into bags (баг). While sums always have a permanent settlement as administrative center, many bags don't. 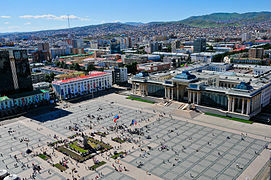 Ulaanbaatar is divided into nine düüregs (дүүрэг, usually translated as district), which are further subdivided into khoroos (хороо, most often translated as subdistrict, microdistrict or simply district). 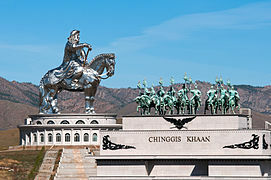 Chinggis Khaan International Airport (formerly Buyant Ukhaa Airport) (Mongolian: Чингис хаан олон улсын нисэх буудал, Çingis hán olon ulsîn niseh búdal, IPA: [t͡ʃʰiŋgis xaːn ɔɮɔŋ uɮsiːŋ nisex puːtaɮ]) (IATA: ULN, ICAO: ZMUB) is the international airport serving Ulaanbaatar, Mongolia, situated 18 km (11 mi) southwest of the capital. It is the largest international air facility in the country. The following are the national records in athletics in Mongolia maintained by the Mongolian Athletic Federation (MAF). 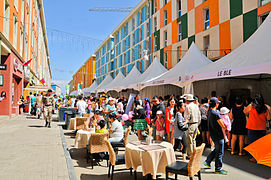 Mongolia has seen a construction boom starting in 2007. Ulaanbaatar is seeing new highrises taller than 75 metres (246 ft). 'High rise building code' and 'Seismic design building code' recommended restrict 17 storey (51 meter+) to 35 storey (150 meter) high rise buildings. 'Seismic design building code' recommended restrict 4 storey (14 meter) to 16 storey (51 meter) mid and low rise buildings. The Mongolian Hockey League (Mongolian: Монгол хоккейн лигийн) is the national ice hockey league in Mongolia. It was first contested in 1992. The Mongolian National Premier League (Mongolian: Монголын Үндэсний Премьер Лиг), also known as the Khurkhree National Premier League for sponsorship reasons, is the top-tier professional association football league of Mongolia. It is contested by ten clubs and operates on a system of promotion and relegation with the 1st League. 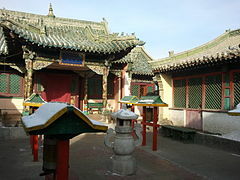 The league is controlled by the Mongolian Football Federation. The inaugural season started in 1955. Seasons start in late April and last until late October or early November. Teams play 18 matches each (playing each team in the league twice, home and away), totalling 180 matches in the season. Mongolia is divided into 21 Provinces or aimags (Mongolian: аймаг) and one provincial municipality. Each aimag is subdivided into several districts. The modern provinces have been established since 1921. 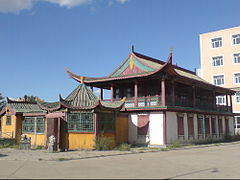 The capital, Ulaanbaatar, is governed as an independent provincial municipality separate from Töv Province, inside which it is situated. 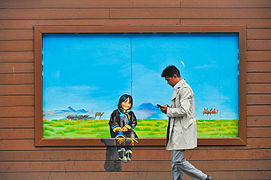 Skytel Group (Mongolian: Скайтел Групп) is one of Mongolia’s leading mobile phone operators that currently holds a quarter of the mobile market. With over 500,000 active subscribers and 400 employees of which 90% have a bachelor's degree or higher education. The company's network functions on an HSPA+ network in Ulaanbaatar and [CDMA2000 1x] & [EVDO] network technology in the rest of the country. Skytel has 43 branches and over 4000 retail shops across Mongolia, and their network covers another 250 counties worldwide. Skytel Group was founded in 1999 and was a joint venture between private Mongolian and Korean firms until December 2010 when it became a 100% national enterprise with equal shareholders of Altai Holding and Shunkhlai Group. 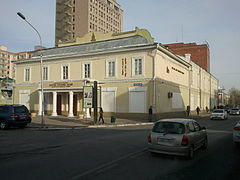 In 2011, Skytel has expanded into a group of companies through the full acquisition of Sky C&C, a well established internet, IDD, SI service provider, as well as major shares of Telemax Communications, a mobile WiMax operator, and Tengis Movie Theatre, the first modern cinema in Mongolia. The company also owns 50% of Skynetworks, a nationwide fiber optic infrastructure operator, and a minor share of Sky Resort, a modern ski, golf resort in Ulaanbaatar. The company offers a variety of services including SkyMarket an e-market of cellular phones to its post-paid OPEN and Nice subscribers, as well as to its pre-paid d20, SkyPhone and SkyCall subscribers. 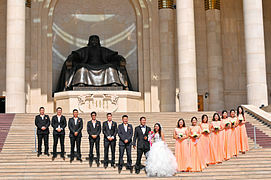 Its headquarters are located in the center of Ulaanbaatar city, on Chinggis Khaan Avenue - 9.